Gone are the days when extraction was the prime solution to serious dental problems. At Ria Family Dental we can save your tooth from extraction through our root canal treatment. The procedure removes infected tooth pulp and replaces it with a filling. 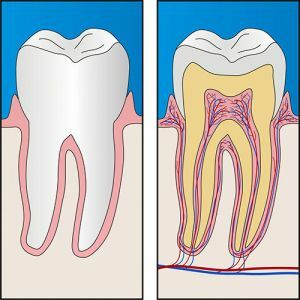 A dental crown is then often used to reinforce the strength of the tooth. This is also called endodontic treatment or therapy. All dentists are trained to conduct the procedure, but you can also seek an opinion or treatment from an endodontist. Unfortunately, many people are hesitant to undergo this dental treatment. Many people also think that it is painful. At Ria Family Dental, we are glad to inform you that our root canal treatment is nearly painless. We make certain it is a safe and nearly painless procedure, so you have no need to worry. The tooth pulp is a soft tissue which contains blood vessels, nerves, and connective tissues. It can be infected for a number of reasons including tooth decay. Once infected, a dental abscess forms and can lead to eventual tooth loss. The success rate for a root canal treatment is quite high. About 90 to 95 percent of patients who had the procedure had a fully functional tooth after the treatment. Coupled with good oral hygiene and proper care, the treated tooth can last a long time. The following are symptoms of infected pulp. However, there are some known cases in which infected pulp doesn’t show any symptom. Only your dentist can help diagnose this, during the course of a regular check up. Don’t endure any dental pain. If you suffer from any of the above-mentioned symptoms, talk to your Ria Family Dental dentist right away. The earlier a damaged tooth is treated, the higher the chances of saving the tooth. Rest assured that the procedure is entirely safe and nearly painless. Your trusted Ria Family Dental team will be with you every step of the way. Talk to us today!